The Wellcome Trust Sanger Institute (previously known as The Sanger Centre) is a non-profit, British genomics and genetics research institute, primarily funded by the Wellcome Trust. It is located on the Wellcome Trust Genome Campus by the village of Hinxton, outside Cambridge. It shares this location with the European Bioinformatics Institute. It was established in 1992 as The Sanger Centre, named after double Nobel Laureate, Frederick Sanger. It was conceived as a large scale DNA sequencing centre to participate in the Human Genome Project, and went on to make the largest single contribution to the gold standard sequence of the human genome. From its inception the Institute established and has maintained a policy of data sharing, and does much of its research in collaboration. Since 2000, the Institute expanded its mission to understand "the role of genetics in health and disease". The Institute now employs around 900 people and engages in four main areas of research: Human genetics, pathogen genetics, mouse and zebrafish genetics and bioinformatics. Commemorative stain window located in the Sulston building of the Wellcome Trust Sanger Institute, to mark the opening of the Genome Campus. In 1993 the then 17 Sanger Institute staff moved into temporary laboratory space at Hinxton Hall in Cambridgeshire. This 55-acre (220,000 m2) site was to become the Wellcome Trust Genome Campus, which has a growing population of around 1300 staff, approximately 900 of whom work at the Sanger Institute. 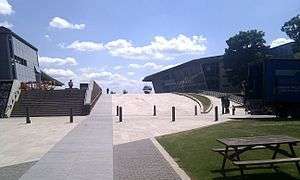 The Genome Campus also includes the Wellcome Trust Conference Centre and the European Bioinformatics Institute. A major extension of the campus was officially opened in 2005; the buildings accommodate new laboratories, a data centre and staff amenities. In discussing the name of the centre, Sanger (still alive when the centre was opened) told John Sulston, the founding director, that the centre "had better be good." Sulston commented, "I rather wished I hadn’t asked." The Sanger Institute's sequencing staff handle millions of DNA samples each week. The Institute "capitalises on leading-edge technologies to answer questions unanswerable only a few years ago". The advances in technology allow the Sanger Institute to carry out sequencing of the genomes of individual humans, vertebrate species and pathogens, at an ever increasing pace and reducing cost. The Institute has more than 100 ongoing pathogen sequencing projects. The output of the Sanger Institute is around 10 billion bases of raw sequence data per day. Ensembl, a genome browser co-hosted by the European Bioinformatics Institute. Mouse Genetics Project, including a database of standardised phenotypic analysis for many hundreds of mutant mice. WormBase, a database on the biology and sequence of the model organism C. elegans and other related Nematodes. WormBase ParaSite, a database for the genomics for parasitic helminths (both Nematodes and Platyhelminthes). The hall Institute's research in human genetics focuses on the characterisation of human genetic variation in health and disease. Aside from the Institute's contribution to the Human Genome Project, researchers at the Sanger Institute have made contributions in various research areas relating to disease, population comparative and evolutionary genetics. In January 2008, the launch of the 1000 Genomes Project, a collaboration with scientists around the globe, signalled an effort to sequence the genomes of 1000 individuals in order to create the "most detailed map of human genetic variation to support disease studies". The data from the pilot projects was made freely available in public databases in June 2010. In 2010, the Sanger Institute announced its participation in the UK10K project, which will sequence the genomes of 10,000 individuals to identify rare genetic variants and their effects on human health. The Sanger Institute is also part of the International Cancer Genome Consortium, an international effort to describe different cancer tumour types. It is also part of the GENCODE and ENCODE research programmes to create an encyclopaedia of DNA elements. The mouse and zebrafish genetics programme at the Sanger Institute uses genome sequence of these model organisms to understand basic biological mechanisms, and gene function in human health and disease. Projects include the study of development, cancer, hearing and behaviour. The Institute carries out research in pathogen genetics to bolster understanding of the effects of genome variation on the biology of host-pathogen interactions. Research is underway at the Sanger Institute into the genomes of pathogens including many bacteria, viruses and parasites. The Pathogen Sequencing Advisory Group (PSAG) considers proposals or suggestions for sequencing of any genome of particular importance. All the genomes after sequencing are made available at the web-based onsite-maintained database, GeneDB. The Sanger Institute's bioinformatics teams have developed IT systems for sequencing and postgenomic research. The Institute houses genome resources, RNA, protein and other family resources and functional annotation databases and resources. Researchers worldwide are able to use these resources to make inferences of genomic knowledge through computational analysis and integration of data. The genome sequencing of S. pombe, C. elegans, mouse and the Malaria parasite. Children at a public outreach event thread bracelets in four colours to spell out a DNA sequence. The Sanger Institute has a programme of public engagement activity. The programme aims to make complex biomedical research accessible to a range of audiences including school students and their teachers, and local community members. The Communication and Public Engagement programme aims to "encourage informed discussion about issues relevant to Sanger Institute research" and "foster a community of researchers who can engage effectively with different audiences". The Institute hosts visits for more than 1,500 students, teachers and community groups per year. Visitors may meet scientific staff, tour the Institute and its facilities, and participate in ethical debates and activities. The programme also offers professional development sessions for teachers of GCSE and post 16 science through the national network of Science Learning Centres, and by hosting visits for groups interested in updating their knowledge in contemporary genetics. Videoconferencing into the Sanger Institute is also offered for Science Learning Centres, Science Centres and schools. The programme maintains a dedicated public website, yourgenome.org, that is intended to help people understand genetics and genomics science and its implications for society. The website includes teaching resources for secondary school science teachers that have been developed with Institute researchers. Scientific and public engagement staff also collaborate on and contribute to national projects such as the UK's InsideDNA traveling exhibition and the Who am I? gallery at The Science Museum. They also participate in public events such as the Cambridge Science Festival. The Institute operates two PhD training programmes: a four-year course for basic science graduates, and a thee year course for clinicians. The four-year course permits students to rotate around three different laboratories in order to broaden their scientific horizons before choosing a PhD project. Each student is required to choose at least one experimental one informatics-based rotation project. Institute houses approximately 50 pre-doctoral students, all of whom are registered at the University of Cambridge. The Sanger Board of Management are guided by the scientific advisory board whose members include Professor David Altshuler, Professor Anton Berns, Professor David J. Lipman, Professor Kevin Marsh and Professor Sir Paul Nurse. John E. Sulston was the founding Director of the Sanger Institute. Sulston was instrumental in the choice of the Hinxton site for the Institute and remained there as Director until the announcement of the completion of the draft human genome in 2000. Sulston graduated from the University of Cambridge in 1963 and completed his PhD on the chemical synthesis of DNA in 1966. He shared the 2002 Nobel Prize in Physiology or Medicine with Robert Horvitz and Sydney Brenner, two years after standing down as Director of the Institute. In 2000, Allan Bradley left his appointment as Professor at the Baylor College of Medicine, in the USA, to take up the position as Director of the Sanger Institute. Bradley wanted to build on the achievements made by the Sanger Institute in the Human Genome Project by "concentrating on gene function, cancer genomics, and the genomes of model organisms such as the mouse and the zebrafish". 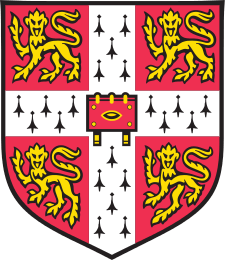 Bradley received his BA, MA and PhD in Genetics from the University of Cambridge. In 2010, Bradley stepped down from his leadership role to form a startup company, but remains on the faculty of the Institute as Director Emeritus. Mike Stratton, who is a leader of the Cancer Genome Project and the International Cancer Genome Consortium, was appointed Director of the Sanger Institute in May of that year. The Wellcome Trust Sanger Institute was established in 1992, funded by the Wellcome Trust and the UK's Medical Research Council. One of the primary goals of the Institute on its creation, was to "play a role in mapping, sequencing and decoding the human genome and the genomes of other organisms". The Sanger Institute now hosts several research programmes aiming to elucidate the associations between genes and biological traits - most often disease susceptibilities. The Sanger Institute has, since inception, maintained a policy that "aims to provide rapid access to data sets of use to the research community". The Sanger Institute was opened in 1993, three years after the inception of the Human Genome Project, and went on to make the largest single contribution to the gold standard sequence of the human genome, published in 2004. The Institute was engaged in collaborations to sequence 8 of the 23 human pairs of chromosomes (1, 6, 9, 10, 13, 20, 22, and X). Since the publishing of the human genome, research carried out at the Institute has developed beyond sequencing of organisms into various biomedical research areas, including studies into diseases such as cancer, malaria and diabetes. ↑ "MRC Centre United Kingdom: Wellcome Trust Sanger Institute". 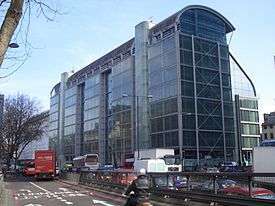 Medical Research Council. Retrieved 2008-12-22. ↑ Walker, John (2014). "Frederick Sanger (1918–2013) Double Nobel-prizewinning genomics pioneer". Nature. 505 (7481): 27. doi:10.1038/505027a. PMID 24380948. ↑ Sanger, F. (1988). "Sequences, Sequences, and Sequences". Annual Review of Biochemistry. 57: 1–29. doi:10.1146/annurev.bi.57.070188.000245. PMID 2460023. ↑ "Wellcome Trust Sanger Institute - About us". Wellcome Trust Sanger Institute. Retrieved 2010-06-28. 1 2 "Wellcome Trust Sanger Institute - History". Wellcome Trust Sanger Institute. Retrieved 2010-06-28. ↑ "Wellcome Trust Sanger Institute - Work and study". Wellcome Trust Sanger Institute. Retrieved 2010-06-28. ↑ "Wellcome Trust Genome Campus Extension Opened: Visit by Her Royal Highness, The Princess Royal". Wellcome Trust Sanger Institute. Retrieved 2009-01-07. ↑ Doctorow, C. (2008). "Big data: Welcome to the petacentre". Nature. 455 (7209): 16–21. doi:10.1038/455016a. PMID 18769411. ↑ Sulston, John. "Interview with John Sulston". Cold Spring Harbor Laboratories digital archive. Retrieved 13 November 2015. ↑ "Wellcome Trust Sanger Institute - Sequencing". Wellcome Trust Sanger Institute. Retrieved 2010-06-28. ↑ "Wellcome Trust Sanger Institute - Pathogen genomics". Wellcome Trust Sanger Institute. Retrieved 2010-06-28. ↑ Jones, I. "Feature: Highly cited". Wellcome Trust. Retrieved 2009-01-22. ↑ Forbes, S. A.; Beare, D; Gunasekaran, P; Leung, K; Bindal, N; Boutselakis, H; Ding, M; Bamford, S; Cole, C; Ward, S; Kok, C. Y.; Jia, M; De, T; Teague, J. W.; Stratton, M. R.; McDermott, U; Campbell, P. J. (2015). "COSMIC: Exploring the world's knowledge of somatic mutations in human cancer". Nucleic Acids Research. 43 (Database issue): D805–11. doi:10.1093/nar/gku1075. PMC 4383913 . PMID 25355519. ↑ Bragin, E; Chatzimichali, E. A.; Wright, C. F.; Hurles, M. E.; Firth, H. V.; Bevan, A. P.; Swaminathan, G. J. (2014). "DECIPHER: Database for the interpretation of phenotype-linked plausibly pathogenic sequence and copy-number variation". Nucleic Acids Research. 42 (Database issue): D993–D1000. doi:10.1093/nar/gkt937. PMC 3965078 . PMID 24150940. ↑ Cunningham, F; Amode, M. R.; Barrell, D; Beal, K; Billis, K; Brent, S; Carvalho-Silva, D; Clapham, P; Coates, G; Fitzgerald, S; Gil, L; Girón, C. G.; Gordon, L; Hourlier, T; Hunt, S. E.; Janacek, S. H.; Johnson, N; Juettemann, T; Kähäri, A. K.; Keenan, S; Martin, F. J.; Maurel, T; McLaren, W; Murphy, D. N.; Nag, R; Overduin, B; Parker, A; Patricio, M; Perry, E; et al. (2015). "Ensembl 2015". Nucleic Acids Research. 43 (Database issue): D662–9. doi:10.1093/nar/gku1010. PMID 25352552. ↑ Logan-Klumpler, F. J.; De Silva, N; Boehme, U; Rogers, M. B.; Velarde, G; McQuillan, J. A.; Carver, T; Aslett, M; Olsen, C; Subramanian, S; Phan, I; Farris, C; Mitra, S; Ramasamy, G; Wang, H; Tivey, A; Jackson, A; Houston, R; Parkhill, J; Holden, M; Harb, O. S.; Brunk, B. P.; Myler, P. J.; Roos, D; Carrington, M; Smith, D. F.; Hertz-Fowler, C; Berriman, M (2012). "GeneDB--an annotation database for pathogens". Nucleic Acids Research. 40 (Database issue): D98–108. doi:10.1093/nar/gkr1032. PMC 3245030 . PMID 22116062. ↑ Rawlings, N. D.; Waller, M; Barrett, A. J.; Bateman, A (2014). "MEROPS: The database of proteolytic enzymes, their substrates and inhibitors". Nucleic Acids Research. 42 (Database issue): D503–9. doi:10.1093/nar/gkt953. PMC 3964991 . PMID 24157837. ↑ Finn, R. D.; Bateman, A; Clements, J; Coggill, P; Eberhardt, R. Y.; Eddy, S. R.; Heger, A; Hetherington, K; Holm, L; Mistry, J; Sonnhammer, E. L.; Tate, J; Punta, M (2014). "Pfam: The protein families database". Nucleic Acids Research. 42 (Database issue): D222–30. doi:10.1093/nar/gkt1223. PMC 3965110 . PMID 24288371. ↑ Nawrocki, E. P.; Burge, S. W.; Bateman, A; Daub, J; Eberhardt, R. Y.; Eddy, S. R.; Floden, E. W.; Gardner, P. P.; Jones, T. A.; Tate, J; Finn, R. D. (2015). "Rfam 12.0: Updates to the RNA families database". Nucleic Acids Research. 43 (Database issue): D130–7. doi:10.1093/nar/gku1063. PMC 4383904 . PMID 25392425. ↑ Schreiber, F; Patricio, M; Muffato, M; Pignatelli, M; Bateman, A (2014). "Tree Fam v9: A new website, more species and orthology-on-the-fly". Nucleic Acids Research. 42 (Database issue): D922–5. doi:10.1093/nar/gkt1055. PMC 3965059 . PMID 24194607. ↑ Wilming, L. G.; Gilbert, J. G.; Howe, K; Trevanion, S; Hubbard, T; Harrow, J. L. (2008). "The vertebrate genome annotation (Vega) database". Nucleic Acids Research. 36 (Database issue): D753–60. doi:10.1093/nar/gkm987. PMC 2238886 . PMID 18003653. ↑ Harris, T. W.; Baran, J; Bieri, T; Cabunoc, A; Chan, J; Chen, W. J.; Davis, P; Done, J; Grove, C; Howe, K; Kishore, R; Lee, R; Li, Y; Muller, H. M.; Nakamura, C; Ozersky, P; Paulini, M; Raciti, D; Schindelman, G; Tuli, M. A.; Van Auken, K; Wang, D; Wang, X; Williams, G; Wong, J. D.; Yook, K; Schedl, T; Hodgkin, J; Berriman, M; et al. (2014). "Worm Base 2014: New views of curated biology". Nucleic Acids Research. 42 (Database issue): D789–93. doi:10.1093/nar/gkt1063. PMC 3965043 . PMID 24194605. ↑ "1000 Genomes: A Deep Catalog of Human Genetic Variation". 1000 Genomes Project. Retrieved 2008-12-22. ↑ "1000 Genomes Project releases data from pilot projects on path to providing database for 2,500 human genomes". Wellcome Trust Sanger Institute. Retrieved 2010-06-28. ↑ Kaye, J; Hurles, M; Griffin, H; Grewal, J; Bobrow, M; Timpson, N; Smee, C; Bolton, P; Durbin, R; Dyke, S; Fitzpatrick, D; Kennedy, K; Kent, A; Muddyman, D; Muntoni, F; Raymond, L. F.; Semple, R; Spector, T; Uk, 10K (2014). "Managing clinically significant findings in research: The UK10K example". European Journal of Human Genetics. 22 (9): 1100–4. doi:10.1038/ejhg.2013.290. PMC 4026295 . PMID 24424120. ↑ Muddyman, D; Smee, C; Griffin, H; Kaye, J (2013). "Implementing a successful data-management framework: The UK10K managed access model". Genome Medicine. 5 (11): 100. doi:10.1186/gm504. PMC 3978569 . PMID 24229443. ↑ "Wellcome Trust launches study of 10,000 human genomes in UK". Wellcome Trust Sanger Institute. Retrieved 2010-06-28. ↑ "International Cancer Genome Consortium Homepage". International Cancer Genome Consortium. Retrieved 2009-01-23. ↑ "Wellcome Trust Sanger Institute - ENCODE and GENCODE". Retrieved 2010-06-28. ↑ -, -; Gibbs, R. A.; Belmont, J. W.; Hardenbol, P.; Willis, T. D.; Yu, F.; Yang, H.; Ch'Ang, L. Y.; Huang, W.; Liu, B.; Shen, Y.; Tam, P. K. H.; Tsui, L. C.; Waye, M. M. Y.; Wong, J. T. F.; Zeng, C.; Zhang, Q.; Chee, M. S.; Galver, L. M.; Kruglyak, S.; Murray, S. S.; Oliphant, A. R.; Montpetit, A.; Hudson, T. J.; Chagnon, F.; Ferretti, V.; Leboeuf, M.; Phillips, M. S.; Verner, A.; Kwok, P. Y. (2003). "The International HapMap Project". Nature. 426 (6968): 789–796. doi:10.1038/nature02168. PMID 14685227. 1 2 "Team 104: Communication and Public Engagement Programme". Wellcome Trust Sanger Institute. Retrieved 2009-01-12. ↑ "Wellcome Trust Sanger Institute PhD Programmes". Wellcome Trust Sanger Institute. Retrieved 2009-11-13. ↑ "Sanger PhD and MPhil theses". Archived from the original on 2015-04-07. 1 2 "Sanger Faculty". Archived from the original on 2015-03-16. ↑ "Professor Eleftheria Zeggini, Group Leader". Hinxton: Wellcome Trust Sanger Institute. Archived from the original on 2015-11-11. ↑ Pennisi, Elizabeth (2012). "Profile of Ewan Birney: Genomics' Big Talker". Science. 337 (6099): 1167–1169. doi:10.1126/science.337.6099.1167. PMID 22955814. ↑ "Sanger Advisory Board". Wellcome Trust Sanger Institute. Archived from the original on 2015-04-07. ↑ "Honorary Faculty". Welcome Trust Sanger Institute. Archived from the original on 2015-04-07. ↑ "Previous faculty at the Sanger". Archived from the original on 2015-04-07. ↑ Logan, D. W.; Sandal, M.; Gardner, P. P.; Manske, M.; Bateman, A. (2010). "Ten Simple Rules for Editing Wikipedia". PLOS Computational Biology. 6 (9): e1000941. doi:10.1371/journal.pcbi.1000941. PMC 2947980 . PMID 20941386. ↑ van Ommen, Gertjan (2010). "Obituary: Leena Peltonen-Palotie (1952–2010) A visionary in medical genetics.". Nature. 464 (7291): 992–992. doi:10.1038/464992a. PMID 20393553. ↑ "International Human Genome Sequencing Consortium Announces "Working Draft" of Human Genome". National Human Genome Research Institute. Retrieved 2008-12-09. ↑ Sulston J, Ferry G (2002). The Common Thread: A story of Science, Politics, Ethics, and the Human Genome. The Joseph Henry Press. p. 18. ↑ "The Nobel Prize in Physiology or Medicine 2002". Nobel Prize. Retrieved 2009-01-07. ↑ "Sanger Institute looks to the future". Genome Biology. Archived from the original on January 19, 2004. Retrieved 2008-12-09. ↑ "Professor Allan Bradley". Wellcome Trust Sanger Institute. Archived from the original on 2015-04-07. ↑ Gura, T (2000). "Changing of the guard: Allan Bradley is to head the Sanger Centre, a powerhouse of the Human Genome Project". Nature. 405 (6785): 389. doi:10.1038/35013238. PMID 10839511. ↑ Adam, D (2001). "Sanger Centre welcomes gene funds with a new name". Nature. 413 (6857): 660. doi:10.1038/35099707. PMID 11606985. ↑ Dickson, D (2000). "Geneticist from Baylor named as new head of UK's Sanger Centre". Nature. 405 (6784): 264. doi:10.1038/35012766. PMID 10830929. ↑ "Professor Mike Stratton appointed new Director". Wellcome Trust Sanger Institute. Retrieved 2010-05-17. ↑ "Wellcome Trust Sanger Institute - Data conditions". Wellcome Trust Sanger Institute. Retrieved 2010-06-28. ↑ Human Genome Sequencing Consortium (2004). "Finishing the euchromatic sequence of the human genome". Nature. 431 (7011): 931–945. doi:10.1038/nature03001. PMID 15496913. ↑ Pennisi E (2003). "Reaching Their Goal Early, Sequencing Labs Celebrate". Science. 300 (5618): 409. doi:10.1126/science.300.5618.409. PMID 12702850.